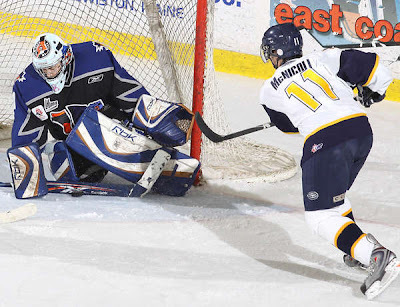 The Lewiston MAINEiacs dropped another hard fought game to the Shawinigan Cataractes 4 - 2 Sunday at the Colisee. The University of Maine Softball team swept a pair of games on Sunday, beating Youngstown State 12 - 5 in the day game and Yale 4 - 3 in the nightcap! The Maine Black Bears Men's Hockey team has an opponent for round 1 of the Hockey East playoffs and it is the Boston University Terriers. BU will host the best of 3 series starting Friday night at Agganis Arena in Boston. The Walking Wounded continues for the Boston Celtics as Big Baby goes down with an ankle sprain in a 86 - 79 loss to the Orlando Magic Sunday at the Garden. In addition to Big Baby Davis going down during the game, The Celts were without Rajon Rondo, KG, Scal and Tony Allen. The road has not been kind to the Boston Bruins the last few days. Manny Fernandez may have played the poorest game by a Boston goaltender Sunday, as the Bruins drop a rough and tumble game against the Rangers 4 - 3. Kevin Youkilis hit his 2nd home run of the WBC as the USA handled Venezuela 15 - 6. Yahoo Sports is reporting Jon Lester signed a 5 year extension, the team is denying any such deal has been struck.